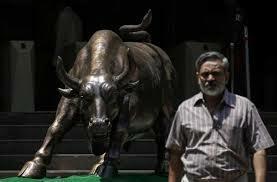 India’s benchmark BSE Sensex will recover from a recent dip to set a record high this year but analysts are less bullish than they were three months ago, a Reuters poll found. The Sensex fell to a 10-week low last week and closed at 27,975.86 on Monday but the poll of 21 analysts taken in the past week forecast it would recover to 29,500 by mid-year and reach a record high of 32,000 by the end of December. The mid-year consensus is a 500-point drop from a poll in December amid fears corporate earnings could miss expectations. And while the index is expected to bounce more than 14 percent by the year-end, that is also less than expected in December. “Corporate earnings will recover towards the end of the year. We’re talking about October-December being the first quarter when there will be a recovery. If this doesn’t happen, it will be a risk,” said Madan Sabnavis, chief economist at CARE Ratings. Analysts identified the implementation of a goods and services tax (GST) and land purchase reforms as other big factors for the stock market. The GST would for the first time transform Asia’s third-largest economy into a single market, streamlining a myriad of state taxes in a bid to make it easier to do business. The land acquisition bill would make it easier for businesses to buy land but it has met opposition from farmers. The two reforms, if passed, would give the biggest boost to the financial services industry and be welcomed by manufacturers after industrial activity fell to a five-month low in February, the poll found. Uncertainty over the timing of a U.S. interest rate rise is another risk for the Sensex. The latest poll of Wall Street’s primary banks forecast the Federal Reserve would tighten in September rather than June as expected earlier. Last year’s rally in Indian stocks surpassed those in rival emerging markets such as Russia and Brazil, but the market has underperformed recently, wiping out most of the gains made since January. Foreign investors have played a key role in India’s bull market, pumping in $ 16.1 billion in 2014 and $ 5.8 billion so far this year, but worries about foreign selling have spooked markets in recent weeks. “A correction was long overdue because it rallied relentlessly last year. A healthy correction for anything that has gone up 45 percent could be between 15-20 percent and we’ve not even seen that from the higher levels,” said Chirag Solanki, a research analyst at Karvy Brokers.